To fully take advantage of my flight controllers I need to use a PPM signal. My Turnigy 9x doesn’t have a native support for PPM signals, so I need to make some sort of work around. After some research on the internet it turned out that the most common solution is use the Frsky system. The Frsky PPM modification looked a bit complicated, but after some more searching it turned out that there also is simpler and cheaper way. You can simply bind you Turnigy 9x with a Hobby King 6ch receiver and get a PPM signal. I must tell you that I haven’t tried any of these methods yet, so I don’t have much more information nor practical experience. Unfortunately the 6ch receiver from HK is out of stock, but when I get it I will write more about the result here at my blog, so stay tuned for more info. PPM and PWM are two different protocols for radio information. The PPM has the advantage that you can get all the channels information through one port only. Some call it PPM sum since it’s the sum of all channels. That helps a lot when you have limit number of connectors to your flightcontroller. So I will use PPM into my flight controller, and then the flight controller will use PWM outputs to the ESCs and to the servos for the camera mount. By using the PPM input, I can now use 10 PWM outputs from my Open Pilot Copter Control instead of 6 PWM outputs. That is for obvious reasons essential for me, because my camera mount needs two servo outputs plus the 6 ESC outputs for my Y6 frame. 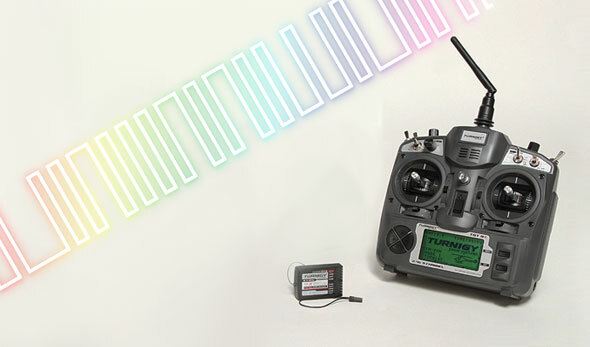 There are two ways to replace the Turnigy 9x transmitter module to a Frsky PPM system. Either you can mount the full module on the back of the transmitter, but then you get two antennas which might interfere with the signal. You also need to cut the antenna wire from the Turnigy 9x module, so you won’t be able to change it back. The other method is to install the Frsky PPM DIY-kit. It requires a little more work, but it generally seems to be a more reliable solution. Here is a great video from RC Reviews, showing how to use the Frsky PPM module with the Turnigy 9x. This looks like a very simple solution. You just bind your Turnigy 9x with a Hobby King 2.4 Ghz 6 channel receiver (part number: HK-T6A-V2). When I first found this info, it was in the context that someone had built a USB interface to use his Turnigy 9x with a flight simulator. Apparently there is a PPM output on that receiver, so I hopefully can just connect it to my flight controllers. For some reason it seems like it’s only 6 channels though. Yes, I know it’s a 6 channel receiver, so I understand that there are only 6 PWM outputs. But I don’t why the receiver makes the extra effort to convert the Turnigy 9x’s 8 channel PPM signal into a 6 channel PPM signal, instead of just letting it through. DIY Turnigy 9x USB connector and trainer port. So the next step for me will be to built a USB connector too. Looks like there is a problem with HK-TR6A-V2, not all of them have PPM output. There is no difference in hardware design of receivers with / without PPM. clock, signals for 6 channels and something similar to I2C between uC and RF device. Is there any solution for that, maybe uC firmware update? That’s interesting, I hadn’t heard that before. I have ordered this receiver from Hobby King, but it is still out of stock so I haven’t got it yet. Hopefully the new batch will have PPM. I will write here to tell you about the results when I have tried it myself. Too bad, I didn’t get no PPM sum out of it either. Hobby King must have removed that feature. Let me know if you find any firmware update. There is no info about possibilities of update software on the receiver. standard Turnigy 9x receiver. I checked bow ow them again using oscilloscope in many points on the PCB boards but there is no signal similar to PPM. Boars are similar: micro controller and RF transceiver connected together by I2C I think. Maybe information is connected with PCB version?